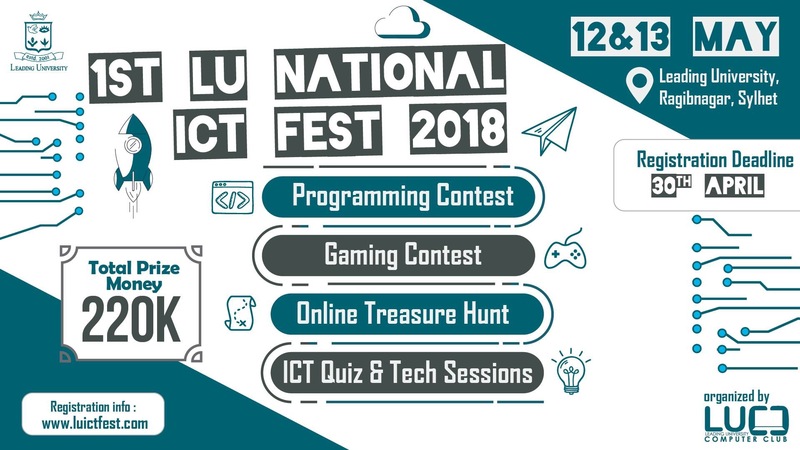 Leading University Computer Club (LUCC) is going to arrange the first ever National ICT Fest in Leading University.The event is titled as “1st LU National ICT Fest 2018”. It will be two days long program on our native campus. The event is featuring programmers, gamers, and students around the country. This event will attract over 3000 programmers, gamers, and students from Bangladesh. The fest is divided into some parts like Programming Contest, Gaming Contest, ICT Olympiad. In Gaming Contest, there will be 4 different games named as “FIFA-18”, “Call of Duty: Modern Warfare(cod4)”,”Online Treasure Hunt”, “Need for Speed-Most Wanted“. *** Each team contains four members. *** Each team contains two members.